takes you to hog heaven! Chrome so bright, it’s practically blinding. Handlebars so high you could fly a flag on them. Back tires that would fit on a bulldozer. And that rumble…the deafening rumble. Everything about a Harley-Davidson motorcycle says “tough guy.” So it’s fitting that Bill Ballint, who once stared down Stage 4 lymphoma – and lived to tell the tale – spends his days making these tough choppers as tough as he is, at his Brazos Customs & Service Center. 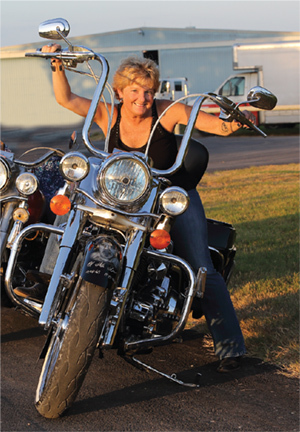 UC: What are seasoned bikers looking for in a custom job? Bill Ballint: Harley riders come in looking to customize their Street Glides, their Road Glides, their V-RODs and CVOs. We’ll do anything from pipes, exhausts, tires, LED lights, custom paint and airbrushing, and even stereo systems. With Harleys, everyone always wanted everything chromed out. Now, chrome is out—black is in. UC: What separates you from larger Harley shops? BB: We’re proud that we retain master mechanics like long time team member Corey Himebaugh. The same people have been working on our bikes since we started. Bikers want skilled craftsmanship and consistency. We’re proud that we can offer that, while the bigger shops have higher costs and more turnover. UC: And how about rookie riders? Do you have to get a new Harley? BB: Actually, the used market is the way to go. You can get a used Harley with just a few thousand miles on it for a third of the cost. Once you customize with us, you could have a bike worth three times what you paid. UC: You’re not just a biker’s best friend—you service ATVs and farm equipment too. BB: A large part of our business is helping off-roaders and hunters with their ATVs—we’ve done vehicles for Ducks Unlimited. And we’ve got farming equipment clients who come from as far as El Campo and Wharton. UC: Back to the bikes: Riding is a family affair for you. What do you love most about it? 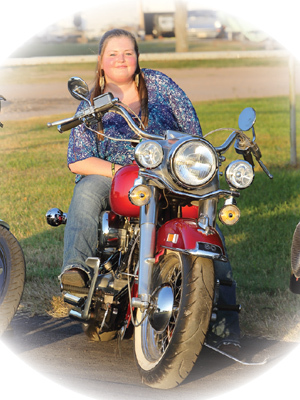 BB: My daughter Kaitlin says, “You don’t focus on anything, just what’s ahead.” And my wife calls it, “wind therapy.” She loves to point out that you never see a motorcycle outside a psychiatrist’s office!